c. somehow the food he makes turns out good. And I mean really good! We like to make fajitas or shrimp tacos for dinner on the weekends and hubby is always in charge of making his now famous pressure cooker black beans. I think it's the only dish he makes which doesn't result in the kitchen looking like the refrigerator exploded. However one weekend last month, he wasn't home early enough to prepare the beans and making them was left to me. Not knowing hubby's recipe, I did my best to recreate a similar version. When he got home I offered him a taste of my attempt, anxiously waiting his reaction. Hubby dramatically smelled the pot of beans, took a spoonful, blew to cool them off, took a bite and after a long pause, finally gave me a thumbs up. It would seem that everyone in our family approved since at dinner that night I looked up to see that Chloe was sporting an enormous bean goatee! 1. Combine the first 6 ingredients in a pressure cooker and, following the manufacturer’s directions, cover and lock the lid and cook on high pressure for 40 minutes. 2. Allow the steam to release completely (again, following manufacturer’s directions) before opening the pressure cooker lid. 3. Stir in the balsamic vinegar and serve. Someone gave me a pressure cooker and I haven't had much luck with it, I don't eat much meat, so I was about to give it away but this looks great. Maybe I'll keep it, I love black beans. Would love to see more pressure cooker recipes. I am new to pressure cooking but love it to cook sweet potatoes, beets and artichokes. Can you make this recipe in a regular pot or crock pot? We don't have a pressure cooker. More pressure cooker recipes please!! Do you soak the beans before throwing them in or do you just rinse them off and throw them in the pot? Just rinse and place in the pot! YUM - I need to get one!! 8 Cups sounds like a big yield. How long do they last in the fridge? They'll last about 5 days in the fridge. You can also freeze them for up to 3 months! I can't wait to try this. Mine Always turn out so bland. I just never thought to season them so well. Yum! I figure I can reduce the cooking time if I remember to soak them, but we'll see if that happens. Ha! Do you add any oil to the pot to control the foaming? I thought oil was necessary for pressure cooking beans? Oh Shay! You called it. I always add 1 tablespoon of oil to pot before cooking the beans, but somehow left it out. I've made them with and without the oil, but do prefer it. The beans work great either way. Thanks for your keen eyes! 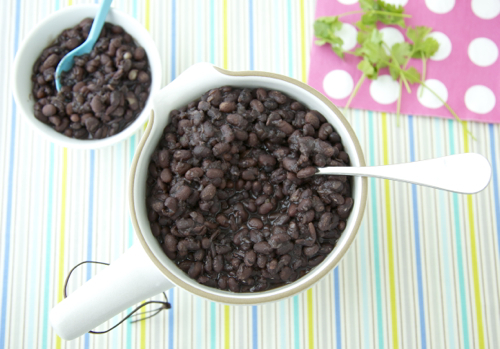 what a great and easy way to make black beans! What pressure cooker was used? I don't see anywhere which one. Thanks. Hi Catherine! I am wanting to try these black beans, but have never used a pressure cooker! I just purchased the same brand that you have and I'm little confused on how to use it? How do you look it on high pressure? Would that just be he high setting in the stove? I know these are silly questions, but I'm nervous I won't do it right thanks!! !